Just want to add a picture to my question and tell you that the bag seems completely dry to the touch, after being greased/greased off and wet, as I described in my question the other day, but I’m still worried if the grease has invisibly damaged the all weather leather. Please take your time. Thank you again for a great blog and your great respons. I just ordered the black/tan Essex Carrier from the grab bag section, and I’m so excited! It’s my very first Dooney & Bourke, and I’ve wanted one for ages. I love reading your blogs online, and I wanted to ask you–how do I clean it? Is it best not to use leather oils or cleaners? I’ve read that they can strip the properties of the AWL. And is there a way to remove the spot or lighten it? If not, I don’t mind; it doesn’t look that obvious, and I’m not picky, because I love vintage! It looks like this lovely bag still has years of use left in it, and I can’t wait for it to get here! Yes our Grab Bag Section is where we put the bag that have some cosmetic blemishes but are structurally sound and can be used as-is or might benefit from some TLC. I’ve already posted some info on this blog about care. To expand on that………Yes, minimal products to clean and condition. The AWL (All Weather Leather) portion (that’s the thick pebbly leather than makes up the main body of the bag) needs no conditioning. The British Tan trim is the leather that can show darkening and stains (or beloved patina !) 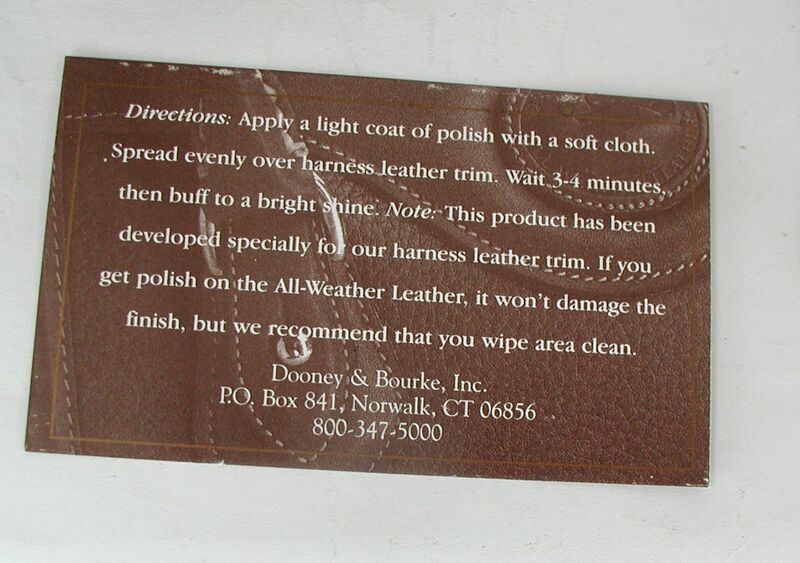 so you can clean it per the instructions from the Dooney website pasted below. Note that if you use harsh cleaners or oil or conditioner on the British Tan, it will change it. Harsh cleaners can remove color and oils and conditioners can darken the tan. 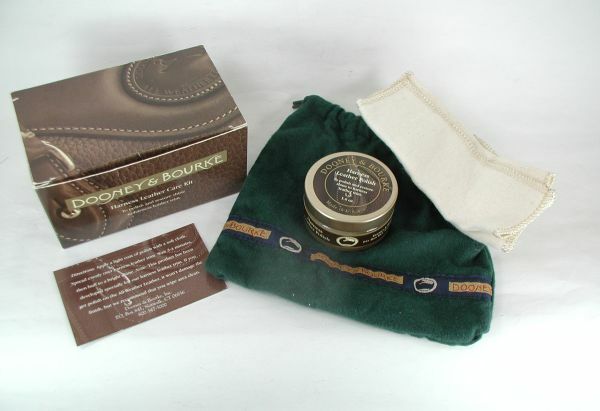 At one point in time Dooney & Bourke sold a product to use on the British Tan trim but they no longer do. It was this item. 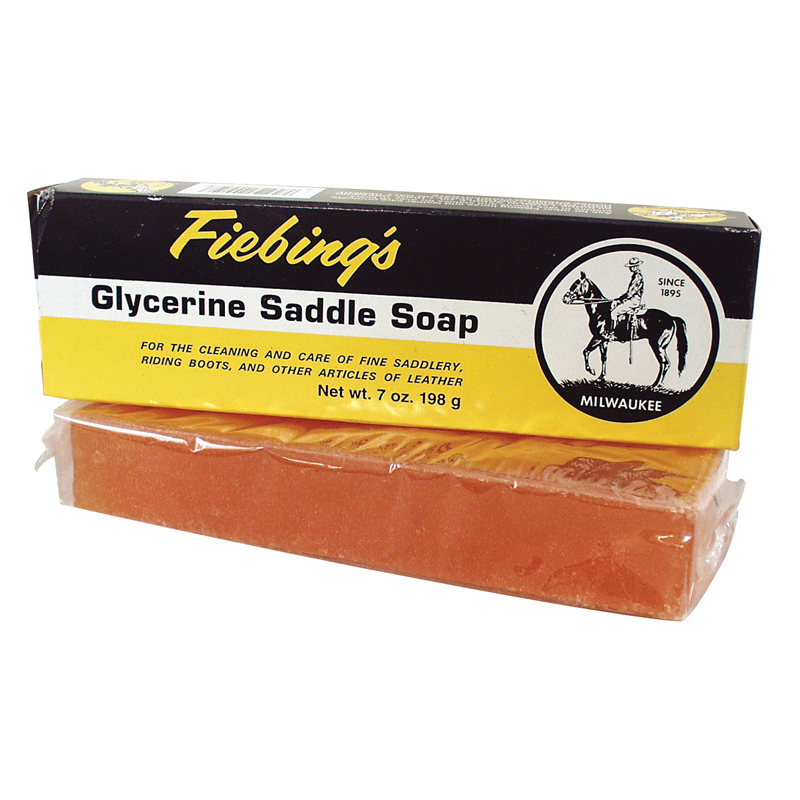 Since that product is no longer available, for the British Tan trim on my own bags, when I want to give them a light cleaning, I use a good quality mild glycerin saddle soap in a bar form, rather than the cream in a can. He’s an idea of what the glycerin bar looks like. 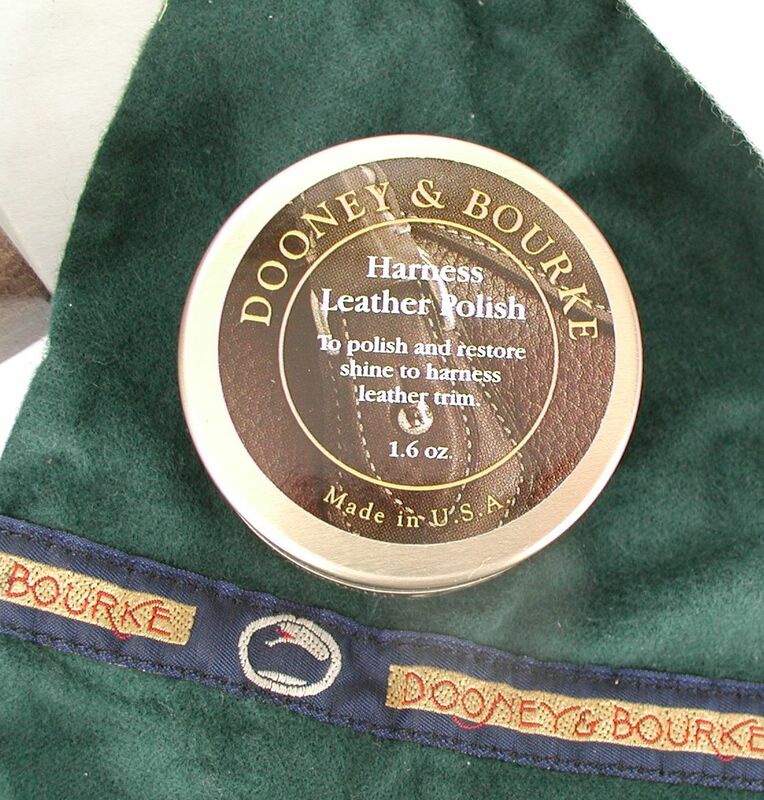 For more information on care and cleaning, you could click the link below and browse the official Dooney & Bourke website – below the link I’ve posted most of the information from the D&B site related to All Weather Leather care. 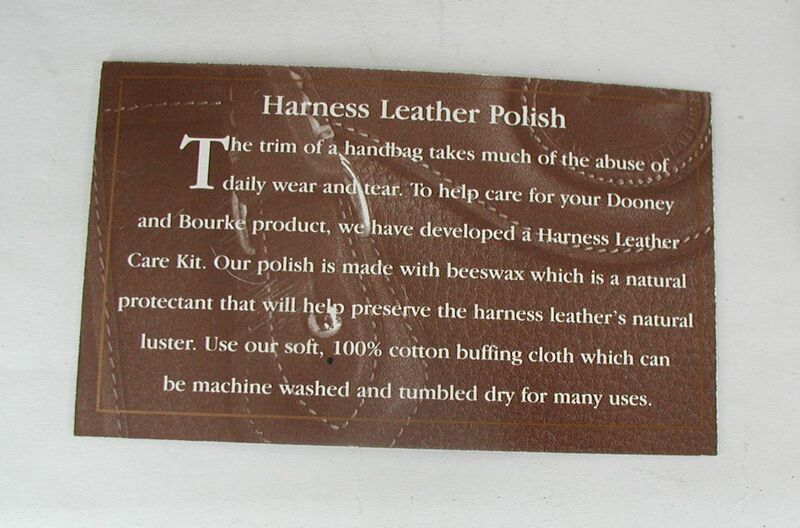 “The leathers used in most Dooney & Bourke merchandise are both water repellent and generally scratch resistant. However, some leathers may become discolored when wet, returning to their original colors once completely dry. I wouldn’t use Kiwi shoe polish, no. Once you get the bag, you can decide how you want to refurbish it, but I’d steer clear of the white shoe polish. If it were my bag, I’d receive it, look at it, maybe even start using it and see if you think the wabi-sabi of a vintage bag is actually more endearing than trying to make it look new. I think that is how I would feel. But if I just couldn’t stand it and wanted to have it perfect, I’d take it to a shoe repair place where they have leather dye and have the white part dyed. Depending on the skill of the repairman, you run the risk of ending up with a new issue – it is hard to do a really neat job around the British Tan trim so………. another alternative is that you could buy the dye and do it yourself. Dye is permanent. Leather dye is thin and has the consistency of a solvent. It sinks into the leather immediately. Conditioners are oily or greasy and sit on top of leather and gradually sink in. making leather softer, more pliable and as D&B says, opens the pores of the leather which in this case is not a good idea. Leather polish is a creamy or waxy top dressing. Especially with white polish, that layer or coat you would put on would flake and crack and come off. It would also alter the the leather in a negative way. So with all that said, I have never dyed a Dooney bag but I have had great success using leather dye on other items such as English riding boots where the color wears off the inside surface of the boot where it rubs against the saddle and the horse. 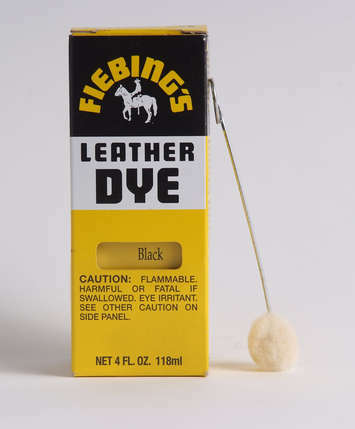 The brand of leather dye I have used is Fiebings and they do make a white dye. Note that if you choose to try to dye a bag to eliminate some of the spots, you will likely have to dye the entire bag because no two whites are the same as no two blacks are browns are. So it is not a project to undertake lightly. 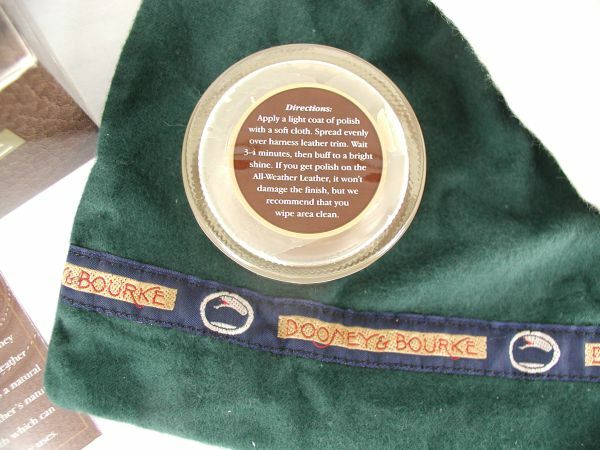 This entry was posted in All Weather Leather, Leather Care, Repair and tagged all weather leather, AWL, British Tan, Dooney, Dooney & Bourke, leather care, vintage Dooney by Native American Jewelry Tips. Bookmark the permalink. Hi I just found your site and it has really great information. I recently bought a vintage AWL purse and cleaned it with leather conitioner. Now that I know I wasn’t suppose to is there any way to seal back the pores and prevent the softening of the leather? 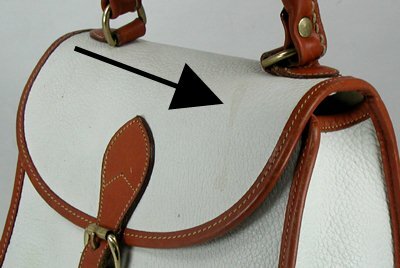 I would like to know your best method for removing soiling and stains from the split leather interior of the R28 Small Satchel (and similar vintage). Incidentally, I own a newer AWL “Dillen” satchel on which I applied Lexol leather cleaner and conditioner about two weeks ago. It left it feeling tacky even after a light buffing but it did blend away imperfections (fading/scuffs in the navy leather). I put it in a dust bag and after a week it was no longer tacky but it looked dull. So I went over it with Cadillac brand shoe & leather cleaner/conditioner followed by a light buffing. It now feels and looks as good as new. I then re-sealed the leather with Apple brand rain/stain repellent. If I had read that the AWL leather couldn’t receive leather cleaners and polishes I wouldn’t have done it. But I know from experience now that if one does clean/condition this type of leather — and for some of the vintage bags that’s a better alternative to it cracking/dying out — it can be done most successfully with Apple brand and Cadillac brand products. Do avoid the more common Lexol, however! We try not to handle too many bags that are not like new inside. Occasionally we get one in a collection when someone sells us their whole closetful. With those, we brush the suede interior vigorously but it there are pen marks, makeup or ink stains, we have not found a good way to remove them. Perhaps someone else reading this blog will know a “solution” !